I’m as busy as a bee, and part of that is because of the free Save The Bees block of the month that starts this Monday at Jacquelynne Steves The Art of Home. As a participating blogger, I get to make the blocks before they are released and host giveaways on my blog. I can’t wait to show you my Save The Bees block, so I’ll give you a sneak peak at what it looks like. I’m using a black, gray and white color palette with a splash of yellow thrown in. I already love this project so much! 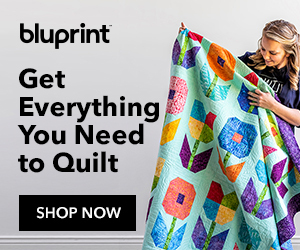 I have a secret, new tool that I’m going to share with you that will make your applique blocks sew much easier and quicker to make! You’ll have to wait until Monday to find out what it is. I know it’s not December yet, but today is Black Friday over at Craftsy (affiliate link). They’re having a huge sale with up to 70% off Knitting, Crochet, Quilting & Sewing supplies. This sale continues through August 6, 2018. I’ve already been “window shopping” and I found a few things that are worth taking home. The Magic Pressing Mat is a new and popular tool that I already own, but it’s wonderful for pressing blocks and you can’t beat this price. I love my Supreme Slider for making free motion quilting easier, and now is the perfect time to purchase those Karen Kay Buckley Perfect Scissors that are so popular (and loved by yours truly). You’ll find tons of fabric marked down, too! I hope your weekend is off to a good start. Make it a creative one! The new quilt along looks too cute! I love your palette of the grays with the bits of yellow. Hi Julie, You are off to a beautiful start. Thank you for the tutorial about how to frame the applique. I think it will look great. I’m new to applique so that would make it much easier to get it sewn down and it would look whimsical and not sloppy. What a gorgeous block. I can visualise a whole quilt covered in bees. Lovely. I like making single bed size quilts. They lend themselves to lovely designs. I am currently making an applique roadway for my grandsons. Individual blocks, each one a different building, the sashed with grey to make the road. I will back it in a dark colour so it can be a camping/play quilt. I have made queen sized quilts but they are a nightmare to quilt even on my quilting machine. When I get rich, I will buy a long arm!! Love your color choices! Can’t wait to see it finished. For some reason, my computer would not let me open the sale item or perfect slider, etc. I will have to find another way of getting around it. My grandson went into the Marines so I am looking to make him a quilt when he gets out of boot camp. That is my new project so I will not be making the Save the Bees even though it is so cute. Oh, I wish I had known what you were doing before I went out and purchased fabrics for the Save The Bees BOM… I like the colors that it calls for, but I’d LOVE to be doing what you are ( and I probably would have been able to buy less ‘extra’ fabric lol). Either way, I’m going to enjoy doing it – anything with bees has my attention. My Grandma Smith’s first name was Beatrice and when I was growing up, we called her Grandma Smith, but when our kids ( her great grandkids) came along, she decided that she’d like them to call her Grandma Bee. – the front license plate on her car even had a bumble bee on it. She was a special grandma, great grandma and great- great grandma who is dearly missed by many. Hello Julie; I am looking forward to starting the Save The Bees BOM. I like your fabric color choices of what you have shared. They look like a fabulous combination of fabrics! Thank you for the notice on the Craftsy sale also. I will have to go and look. Have a fabulous day!